The Hähnel Tuffs are, well, tough! Made up of two complementary units: a transmitter that sits on the camera’s hot shoe and a receiver with a hot shoe for the remote flash to sit in. Plug them in, turn them on and the camera is shooting in full Canon TTL mode without even consulting the manual. They are light but made out of a strong plastic material and covered with a protective and removable silicone rubber cover, giving them a go-anywhere take-anything-you-can-throw-at-them feel. The receiver also acts as a foot for the flash, which means you can sit on a table, shelf or any level surface without extra clamps or accessories. The buttons and controls are oversize, easily accessed but discrete, which means they are easy to use and don’t get in the way — very well thought through design and details. I didn’t abuse the review set but felt that they would be ideal for adventure photographers remotely lighting mountain bikers, kayakers, abseilers and all those activities you have to get off the couch for. Extra features include a button on the transmitter that cycles through a couple of modes to take advantage of Canon’s extra features. For example high-speed sync allows you to shoot flash at (surprise, surprise) faster shutter speeds — up to 1/8000s, albeit with a large penalty in flash output. Also useful is the rear-curtain sync setting, much beloved of sport and action photographers needing the slow-shutter blur behind (instead of in front of) the flash-frozen image of the hurtling mountain-biker, kayaker, abseiler, et al. 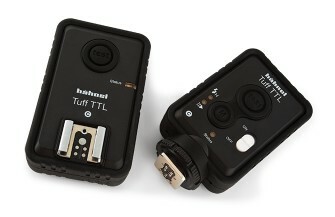 The Hähnel trigger sits somewhere between the two main types of wireless radio trigger systems — ‘dumb’ triggers, which only fire the connected flash and cannot change settings or use TTL metering, and ‘smart’ triggers, where the trigger can talk to both the camera and remote flash and adjust settings. Like the smart triggers, the Hähnel hijacks the Canon’s TTL signal and converts it to a digital wireless signal so you have complete control of a single remote flash. Unlike the smart triggers, it doesn’t have or need another flash or controller piggybacked on it to control the remote flash. So now you can put your flash behind walls, inside large reflectors or up to 300m away. If the resultant flash exposure looks too dark, use the flash compensation dial on the camera to adjust it. However, like the dumb triggers you cannot control the manual output of the flash from the camera. Instead, you need to go to the flash, switch it to Manual, adjust its output, go back to the camera, take a photo, check the exposure, go back to the flash, adjust the output ... you get the idea. You also don’t get the advantage of independent control over multiple receivers. The Hähnel Tuffs have been the most reliable radio triggers I think I have ever used. They still fired consistently at 300m line of sight, or 200m with a blocking body or in a reflector. Also, they don’t appear to be as spooked by nearby large objects that tend to interfere with most triggers’ radio signals. And they also worked reliably close to the ground and in wet conditions, all of which is often too much for trigger systems costing hundreds more. And if someone nearby is using a Hähnel Tuff as well, then you (or they) can change the digital wireless channel to avoid interference. This article is from D-Photo issue 51. Get your copy here.